There are people who do the bare minimum asked of them. Colin Harris isn’t one of those people. The idea to run across Canada first took root in his mind when he was 13 years old and living in Winnipeg, Manitoba. He was born in Drumheller, Alberta, but moved around the country whenever his pastor parents were reassigned. So it was that Colin found himself on Portage Avenue when the torch procession for the 1988 Calgary Olympics passed through Winnipeg. Ness Junior High School let its students out at noon on that cold winter day to watch the ceremony and light their mini torches by the official Olympic flame. Like many of the students, he wasn’t satisfied with returning to school after lighting his mini torch and started running with the group carrying the real torch. But when the last of his classmates had turned to walk back to school, Colin kept running. He ran all the way to the city limits, until the runner carrying the torch hopped into a truck and drove away. On January 17, 2011, that dream began coming true. 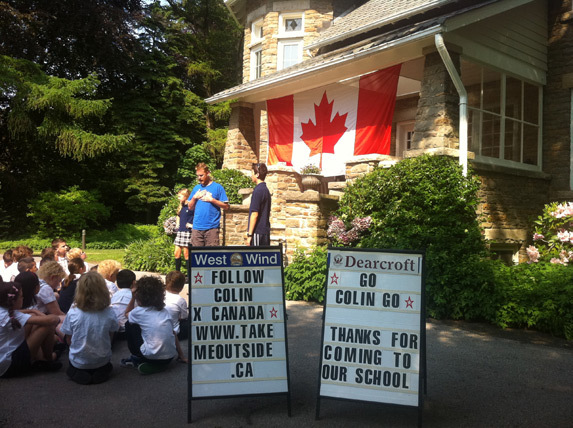 Through Take Me Outside (TMO), the non-profit organization he founded in 2010, Colin embarked on a nine-month journey across the country. 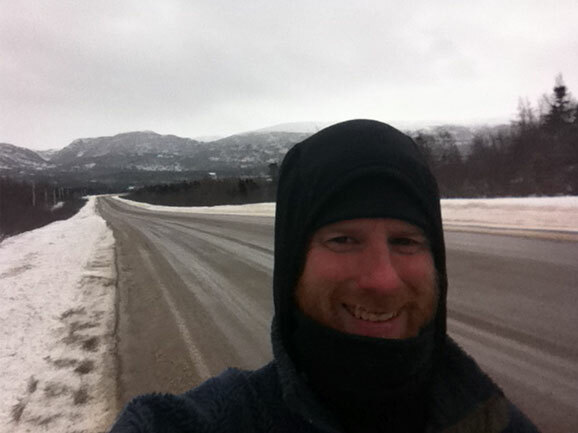 His goal: to run approximately 7,500km from St. John’s, Newfoundland to Victoria, British Columbia, raising awareness of outdoor education along the way. Kickass Canadian Emily Wilson recommended Colin for this site. 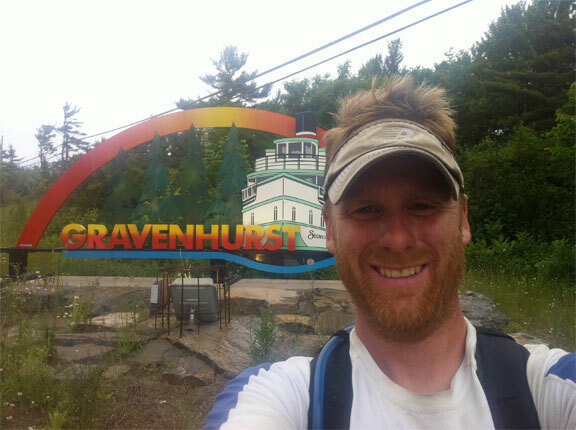 When I interviewed him, he was just past Gravenhurst, Ontario, and about to set out on the most challenging leg of his run—the solo part. 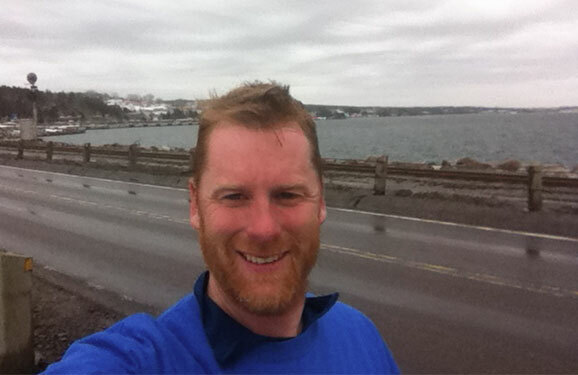 His good friend Sarah Powell took a leave of absence from her teaching position in Dartmouth, Nova Scotia, to drive Colin’s RV and support him throughout his run. 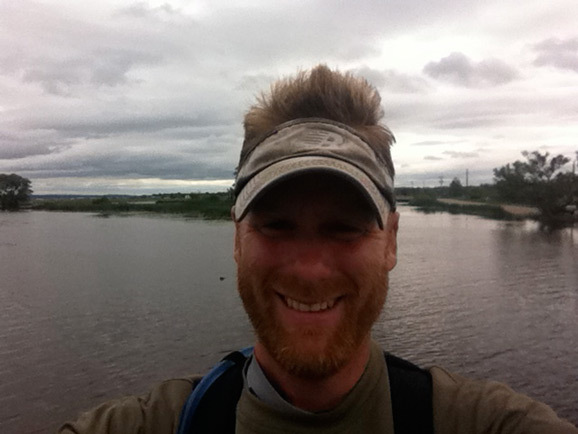 But due to personal obligations, Sarah returned home in late June, and from western Ontario onward, Colin will be completing most of the journey on his own. He’s got a few pinch-hitters lined up to drive, including his father, but the rest of the time his plan is to stagger runs between hitchhiking back to his RV and driving back to where he stopped, before taking off again on foot. When Colin brought me up to speed on his situation, I was awestruck. His tenacity, perseverance and dedication, not to mention endurance, had me wondering: how did this all come about? There was the initial inspiration of the 1988 Olympics. There was also a childhood spent playing outside, before onscreen entertainment exploded into our lives, back when “kids weren’t really sitting around all day.” Over the years, Colin’s quest for physical activity grew stronger. He graduated from cross-country to 10km races, and completed his first marathon in 1997—the Canadian International Marathon (now the GoodLife Toronto Marathon). Since then, he has run more than 30 half, full and ultra marathons. 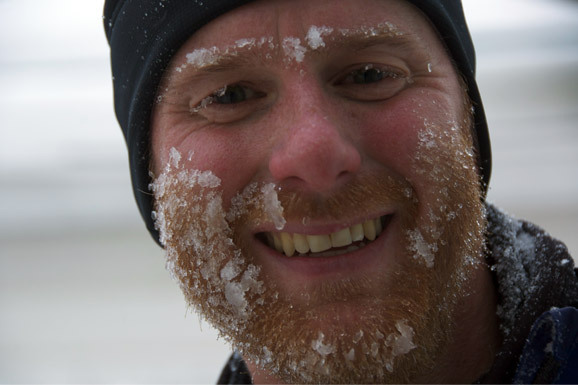 His interest in outdoor education is something he says he “kind of fell into.” Under the influence of his very musical family, and with a background in classical trombone, he enrolled in the music education program at the University of Toronto in 1995. But although he was intrigued by the education system, “after four years of the program, I decided that teaching in the classroom wasn’t for me,” he says. Over the next few years, Colin spent as much time as he could outdoors. After a brief tree planting stint, he travelled to the Northwest Territories, where he worked with First Nations students through the Western Arctic Leadership Program (WALP). His work up north led him back to a more formal classroom setting when he took a supply teaching position at Joseph Burr Tyrrell School. But he always found ways to take the students outside to play and learn in the mountains. As Colin saw more and children foregoing time outside for time in front of a screen—be it computers, televisions, video game consoles—he looked into the statistics and was alarmed to discover that the average Canadian youth spends 50 hours per week in front of screens. That finding, combined with increasing rates of childhood obesity and diabetes, lit a fire under him. 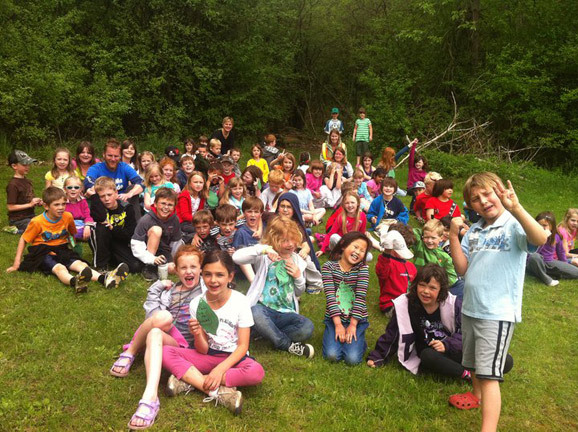 His own experience with outdoor education, and a slew of studies correlating outdoor physical activity with improved health, convinced him that it was time to help get kids back outside. In 2008, he came across a t-shirt made by the graduating class of Queen’s University teacher’s college students. The shirt read: “Ask your teacher to take you outside.” He loved the slogan, and promptly began donning the shirt. “Every time I wore it, everyone seemed to like the message on the shirt,” says Colin. Spurred on by the positive feedback, he got permission to acquire the tagline, and started selling his own design of the t-shirt online at takemeoutside.ca, with proceeds going to various Canadian outdoor education programs. Things were going smoothly. He was enjoying his work at Wanakita, the t-shirts were bringing funds and attention to outdoor education, and he’d begun working towards a Master’s of Environmental Education and Communication through Royal Roads University. Colin could have rested on his laurels and no one would have thought any less of him; he was already doing a lot for the betterment of others. But he still had the burning desire to fit in that run someday. 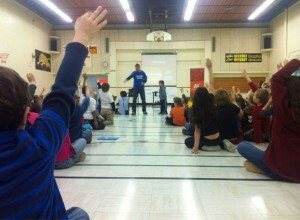 So far, he has visited approximately 65 schools across eastern Canada. 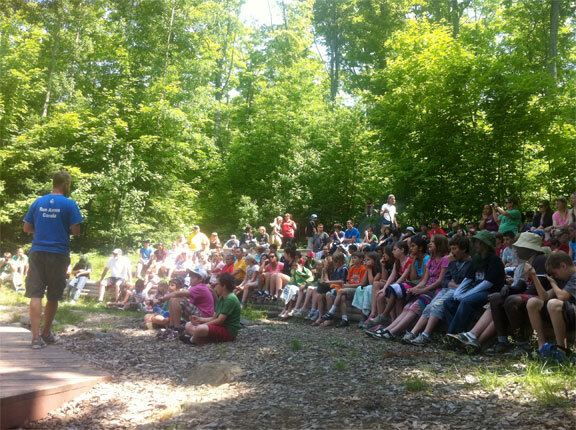 Over the summer, he’ll give talks at camps and provincial parks; come September, he’ll start up again with the in-school presentations, by which time he should be in Alberta. All told, he expects to make stops at about 85 Canadian schools, which he says is his favourite part of the journey. Colin’s goals are admirable. They become flat-out incredible when you consider that he’s doing most of this on his own. Funding has come largely through credit cards, although there is also a donation section on the TMO website, and t-shirt proceeds are currently going towards the run (in addition to online t-shirt sales, Mountain Equipment Co-op now sells the shirts at many locations across Canada). He’s tending to his own injuries by “actively listening” to his body, adjusting his gait and inflicting self-massage. 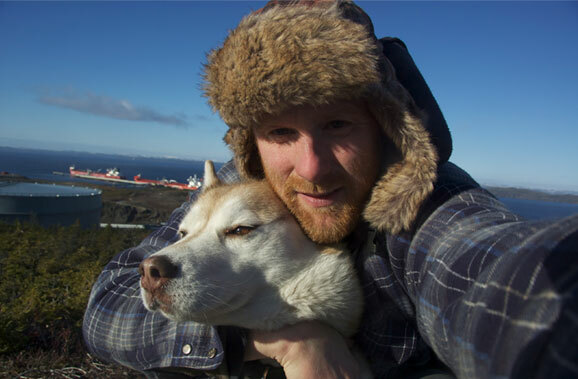 With Sarah back in Nova Scotia, it’s up to him to arrange meals and take care of his eight-year-old husky Koona, who’s accompanying him from the comfort of the RV. But Colin is forging ahead. He is, after all, the man who ran through Newfoundland in January and February. While he runs, he thinks about which direction to take TMO. He plans to finish his Masters by early 2012, and then look into several options for the organization, including the possibility of using it to train teachers how to better integrate outdoor activity into their curriculum. Whatever path he ends up choosing, there’s no doubt he’ll see it through to the end. And with that, Colin is off again. Running in the great outdoors. 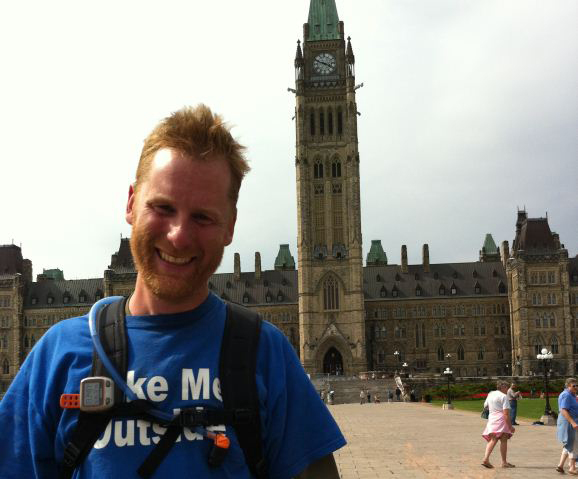 To follow Colin’s progress, visit takemeoutside.ca, ‘Like’ the organization’s Facebook page, follow @tmoproject on Twitter or email info@takemeoutside.ca. My family and I met you at the Terry Fox Monument in Thunder Bay in our travels home from Winnipeg. You really inspired my daughter and she talks about you all of the time. We wish you well, Colin. I think what you’re doing is very important in this time where children are struggling with lack of activity, which also affects their health. Be safe. Thanks for your comment Janette. And it was great sharing a bit of that moment at the Memorial with you. And thanks to Amanda for writing this piece… much appreciated!